German Unity Day was this past Wednesday. Our friend, the talented and thoughtful Claire Gebben has written a wonderful blog post about it, and you can read that here. Claire has relatives in Germany and they can speak to the difficulty of living in a divided country. Christa Wolf also weighs in on this experience in her beautiful, complicated novels. Then the wall came down. And the McDonalds moved in. People could travel. But many writers lost their publishing venues, because those venues were absorbed and annulled. Certain political possibilities were seen as unrealistic. Certain realities set in. 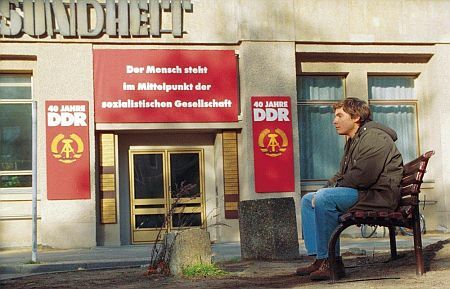 The film Good Bye Lenin, does a fantastic job of expressing the complexity of what was gained by what we call “reunification.” And also, what was lost. Because something was. Before we got sucked back into the maw of history. that had trapped us for centuries. We tried – and failed it’s true – to liberate ourselves by erecting a wall of difference. We repaired umbrellas, served lemonade in real glasses. And when you walked the streets you were struck by silence – the lack of commercial electricity. Flowers were cheap and books precious. Poets declaimed in homes and coffee houses. There was talk. Can you say as much? Lyrics to the GDR national anthem can be read in German and English here. You can hear the GDR national anthem here. It’s true — GDRers also lost their trippy Trabant cars. Love the letter, thanks!